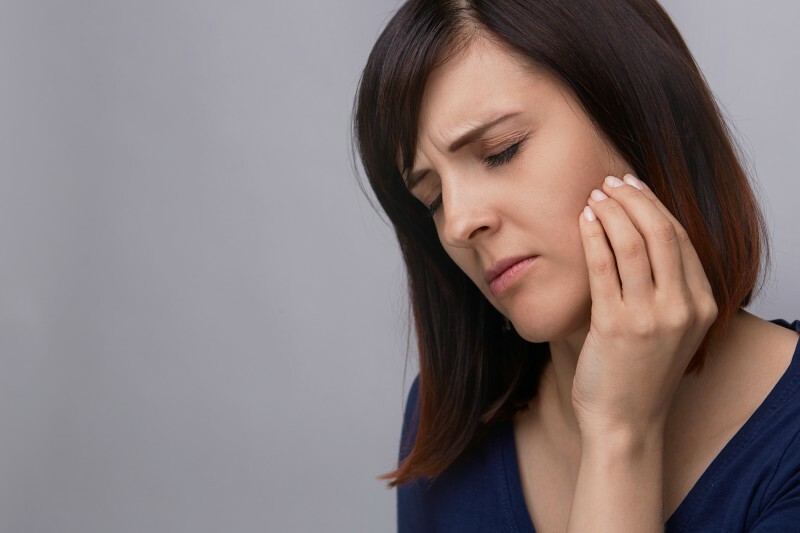 With temporomandibular joint dysfunction, you may be experiencing a number of uncomfortable symptoms, such as headaches, discomfort while chewing and speaking or even difficulty opening your mouth wide. At Skutak Dental, Dr. Lisa Skutak is an experienced comprehensive and restorative dentist. She has treated a number of TMJ/TMD cases, and can help you get relief from the discomfort and inconvenience of issues related to the temporomandibular joint. The terms TMJ and TMD are typically used interchangeably, to refer to a dysfunction or disorder of the temporomandibular joint. This is the joint that connects your jawbone to your skull, directly beneath your ear. It’s a delicate joint with many tendons, muscles and ligaments. If it becomes inflamed, dislocated or damaged, it can cause a variety of uncomfortable symptoms. The most common symptoms of TMJ/TMD include radiating pain around the joint, stiffness of the jaw, “clicking” or “popping” sounds when yawning or chewing and headaches. TMJ/TMD can be caused by a number of different issues. Teeth grinding (bruxism) is a common cause, as it puts strain on the joint and on your teeth and can result in damage and inflammation to the temporomandibular joint. TMJ/TMD can also be caused by joint overuse, such as chewing too much gum or making a habit of biting non-food objects like your fingernails or pen caps. Another common cause is arthritis, which can result in the inflammation and deterioration of the joint. Impact injuries, such as a blow to the side of the face, can also cause TMJ/TMD if the joint is damaged or knocked out of alignment. Your TMJ/TMD treatment will vary based on the root cause of your disorder and the severity of the damage to the joint. Minor cases of TMJ/TMD can often be resolved by resting the joint and taking anti-inflammatory medicines. Lifestyle changes, such as reducing stress, wearing a night guard to prevent teeth clenching and grinding, or ceasing the chewing of gum and non-food objects may also be recommended. For TMJ/TMD caused by arthritis or joint deterioration, corticosteroids may be used. Surgical intervention is rarely required, but sometimes recommended in situations where the joint has been seriously damaged. If you have been suffering from any of the symptoms of TMJ/TMD, don’t wait. Getting relief is just a phone call away. Dr. Lisa M. Skutak is an experienced restorative dentist, and she’s here to help you get relief from pain and discomfort. Contact us now at (715) 355-4433 to schedule a consultation, or stop by our office near Wausau and Schofield at 700 Eagle Nest Boulevard, Suite E, Rothschild, WI 54474. Skutak Dental is a general and family dental practice focused on personalized care. We provide compassionate care in a safe space, and we have a wonderful team that’s dedicated to that.